In 1985, 12 people were killed in Uster, Switzerland when the concrete roof of a swimming pool collapsed only after thirteen years of use. The roof was supported by stainless steel rods in tension, which failed due to stress corrosion cracking. Last year, the suspended ceiling of a municipal swimming pool in the Netherlands collapsed due to a similar cause. There have been other incidents associated with the use of stainless steel in safety-critical load-bearing applications in the environment created by modern indoor swimming pools and leisure centers. The collapse of this ceiling above a swimming pool showed how a simple structural concept could be sensitive to the loss, through corrosion, of support from one of many hangers. Chloride can overcome the passivity of the natural oxide film on the surface of the steel. The steel, lacking its passive film, readily releases iron atoms into solution (in this case, moisture is present in the concrete due to the humid environment). Swimming pool environments have changed significantly in recent years, most markedly in leisure pools. Higher water temperatures combined with an increase in the number of bathers, has led to higher levels of chemical disinfection. Chlorine-based disinfectants are the norm, which together with contaminants introduced by bathers, produce chloramines. These are thought to be the most important factor in the corrosion of stainless steel in a swimming pool environment. The temperature of the air in pool halls is generally held about 1oC above water temperature. High air temperatures significantly accelerate corrosion. Atmospheric moisture in pool buildings comes from evaporation of pool water and as droplets from the turbulent water features that have become increasingly common in leisure pools. Higher levels of humidity can lead to condensation in cooler parts of the building and during the cool of the night. Recirculation of pool air (a common method of reducing energy costs) can increase humidity, as well as adding to the build up of contaminants in the atmosphere. Consequently the atmosphere of indoor swimming pools is one of the most aggressive to be found in a building environment. Under the specific temperature conditions near the ceiling, chlorine containing chemical species in vapors from the pool water can condense onto the stainless steel components and dry out. As this can be a repeated cycle, very aggressive concentrations of chlorine-containing species may build up. The situation is aggravated by the fact that components may not be easily accessible for regular cleaning. the presence of a specific aggressive environment. Chlorine containing compounds (by-products of disinfection) may transfer via the pool atmosphere to surfaces remote from the pool itself. These compounds can produce a highly corrosive film, which can lead to SCC. Some grades of stainless steel, including the most familiar 304 and 316 types often specified for swimming pool environments, have long been recognised as susceptible to SCC, but generally only above 55oC. However, the examples of failure given in 1 occurred around 30oC, in highly stressed components which had not been washed by pool water or frequently cleaned. Consequently the standard stainless steel grades that perform perfectly well in pool water or poolside equipment may not be suitable for safety-critical items, i.e. 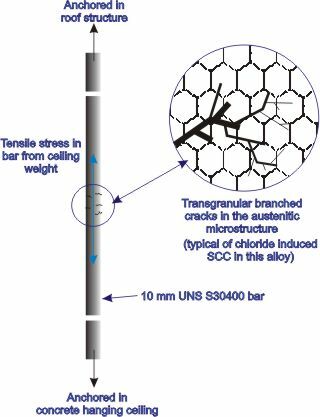 those mainly load-bearing components where fracture could result in a risk of injury - for example, structural components in ceilings or roofs - where they are faced with a combination of mechanical stress and a highly corrosive environment. Components, such as ceiling wire, fasteners, cable strapping and hose clips, which are heavily cold-worked are the most vulnerable. Some component configurations, such as twisted wires and some forms of bolt, nut and washer combinations, create a crevice region, which increases the risk of localized corrosion attack. regular inspection by a competent third party of safety-critical components for signs of corrosion and SCC.